We’re thrilled to announce the launch of our Server Technology Sentry Power Manager (SPM) Trade-In program! For a limited time, ServerTech customers can obtain free Power IQ® DCIM Monitoring licenses and maintenance support for one year. 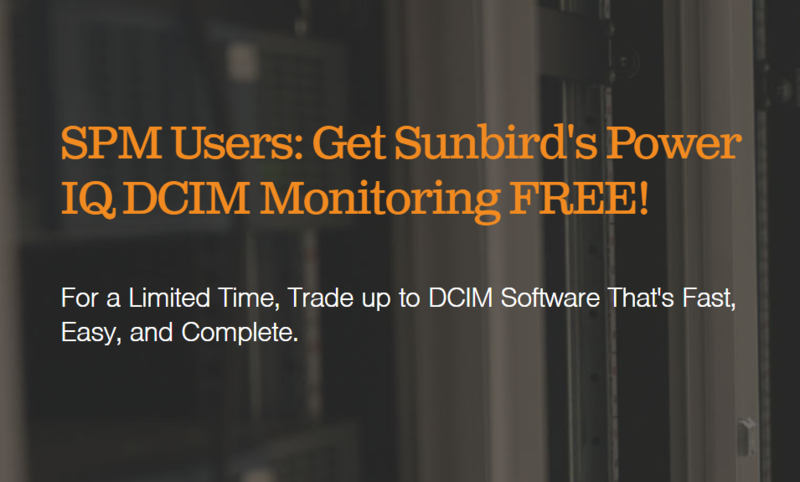 To participate, current Sentry Power Manager customers should visit Sunbird’s trade-in program website and follow the instructions to obtain their free Power IQ licenses and maintenance support for one year. Maintenance includes access to Sunbird’s technical support portal, where customers can download software updates, manage support tickets, and view technical documentation and how-to videos. Power IQ supports the full family of ServerTech PDUs as well as over 50 other manufacturers out-of-the-box, no additional configuration required. Get up and running today with customizable dashboards, high-resolution floor maps with cabinet-level alerts and support for facility equipment monitoring (CRACs, UPSs, Floor PDUs, RPPs, Meters, Branch Circuits, Racks, Rack PDUs, Environment Sensors, IT Devices, and Electronic Door Locks), and patented ASHRAE® psychrometric cooling charts in an elegant, modern UI, PLUS seamless integration with Sunbird's dcTrack® DCIM Operations tool. Trade in your SPM licenses today to get started with DCIM that’s fast, easy, and complete. The trade-in program ends on June 30, 2018. To learn more and request Power IQ licenses, visit http://info.sunbirddcim.com/spm.